Making Antique Jewelry is very easy and quick to do. Crafting your own jewelry especially the kind you like is fun, but, can also be profitable. You won't need expensive tools; you can use glue (E6000 glue) and you might want to try wire wrapping. Some experts use wire wrapping to make jewelry or glue to put the pieces together. It is easy to use filigrees to sew jewelry pieces together by wire wrapping through it. You can make all sorts of vintage jewelry, such as, beaded jewelry, wire jewelry, iron wire art jewelry, Victorian design jewelry, and the list goes on. The history of the antique jewelry wearing dates back to the late Georgian period, George III and IV and William IV were the British monarchs then. In this time, social and political upheaval like, the American Revolution, the French Revolution and the Napoleonic Wars were fought. In 1804 Napoleon crowned himself Emperor of France. Fashion changed dramatically during Napoleon's First Empire, it was a Classical revival. Fashions like, tight bodices, full skirts, and lace collars in the late eighteenth century changed to delicate draped dresses with high waist, short puffed sleeves and low-cut necklines. The jewelry styles were large, heavy pieces and were cast aside for smaller, lighter forms, with draped chains and classical motifs. The history of jewelry making dates back to the primitive humans around 18,000 B.C. or maybe farther back in the B.C. era. They made jewelry out of feathers, bones, shells and wore them. Discovery of the oldest jewelry items were made from fish vertebrae like, necklaces. As times went on, the styles changed with new technology, as human beings advanced throughout different ages and with new supplies of gems. Jewelry disappeared during the Middles Ages from the European trade because the wars and conflicts. During the days of Black Death in the fourteenth century Europe, the noblemen and clergy still dressed in lavish costume and jewelry. In the Renaissance period of the 1500's, jewelry artists designed and produced more elaborate jewelry for both the royal and wealthy people. From thousands of years in B.C., to the middle and renaissance ages to present day Jewelry has become a multi-billion industry. Museums are where you will find the authentic ancient Jewelry or at auction houses. Making Antique Jewelry in the 18th and 19th centuries -- the Georgian period was the introduction of paste, glass, and imitation widely used with engraved gold work. The Victorian jewelry was influenced by the Georgian jewelry styles. Machines were developed to mass produce jewelry by stamping whole pieces of jewelry from thin sheets of metal. 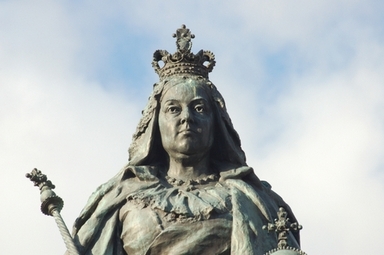 These machines came along during the Queen Victoria's reign in England. The Queen's ascension to the English throne, starting the Victorian period in 1837. She reigned for 64 years. Electroplating was first commercially applied to making antique jewelry in the 1840's. And with the development of gem imitations like paste, this allowed the people of all classes to wear copies of jewelry worn by the rich. So, from the earlier periods of 1800s Georgian and Victorian to 1950s Retro or Modern, jewelry making have been revolutionized ranging from: handmade, machine made, electroplating commercially, hair-work jewelry hair accessories, to women buying kits to make everything from fob watches to rings containing hair, to jewelry being made out of silver, to mixed metal such as, sterling silver with gold, gold plate and oxidized silver, and rolled gold, which were increasingly used, in karats from nine to eighteen. Today, many people are making antique jewelry in shops or in their homes, using guides or instructions by expert jewelry makers. Some people sell the jewelry they make to friends, some start their own businesses whether home-based or shops, and some people make jewelry for themselves and their families only. You can have fun making jewelry by having jewelry parties, going to jewelry making workshops, and jewelry making trade shows.